HENRY, Patrick, statesman, born at Studley, Hanover County, Virginia, 29 May, 1736; died in Red Hill, Charlotte County, Virginia, 6 June, 1799. His father, John Henry, was a Scotchman, son of Alexander Henry and Jean Robertson, a cousin of the historian William Robertson and of the mother of Lord Brougham. His mother was Sarah Winston, of the English family of that name. 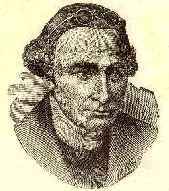 The father of Patrick Henry gave his son a classical education, but he entered upon business at an early age. At eighteen he married, and, having tried farming and merchandise without success, became a lawyer in 1760. His fee-books show a large practice from the beginning of his professional life; but his surpassing powers as an orator were not discovered till, in December, 1763, he argued what is known as the "Parson's cause." This was a suit brought by a minister of the established church in Virginia to recover his salary, which had been fixed at 16,000 pounds of tobacco. A short crop had caused a great advance in its market price, and induced the colonial legislature to pass an act commuting the salaries of the ministers into money at the rate of two pence for a pound of tobacco, which was its former price. This act had not been approved by the king, but the house of burgesses determined to enforce it. 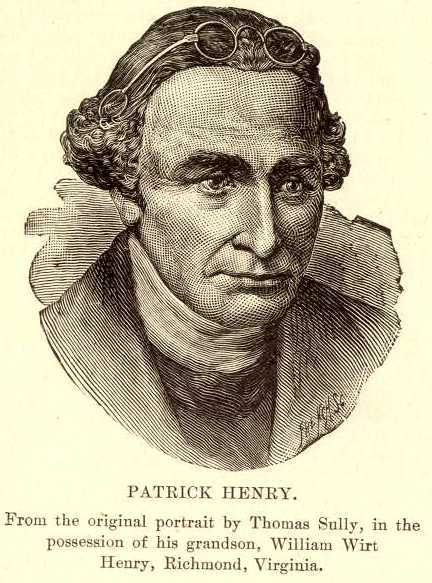 In his speech for the de-fence Mr. Henry displayed powers of oratory of the first order, and boldly struck the key-note of the American Revolution by arguing that "a king, by disallowing acts of a salutary nature, from being the father of his people, degenerates into a tyrant, and forfeits all right to his subjects' obedience." The passage of the stamp-act by the British parliament in 1765 was made known in the colonies in May, 1765. They had remonstrated against its proposed passage; gut no one was bold enough to counsel resistance to its enforcement until, upon the resignation of a member of the Virginia house of burgesses from Louisa county, Mr. Henry was elected to fill the vacancy. On 29 May, 1765, nine days after taking his seat, and on his twenty-ninth birthday, he moved a series of resolutions defining the rights of the colony, and pronouncing the stamp-act unconstitutional and subversive of British and American liberty. These were resisted by all the men that had been previously leaders in that body. "He is by far the most powerful speaker I ever heard. Every word he says not only engages but commands the attention, and your passions are no longer your own when he addresses them. But his eloquence is the smallest part of his merit. He is, in my opinion, the first man upon this continent, as well in abilities as public virtues, and had he lived in Rome about the time of the first Punic war, when the Roman people had arrived at their meridian glory, and their virtues not tarnished, Mr. Henry's talents must have put him at the head of that glorious commonwealth. " 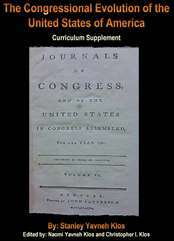 He was a delegate to the 1st Continental congress, and opened its deliberations by a speech that won him the reputation of being the foremost orator on the continent. In this speech he declared, "I am not a Virginian, but an American." In congress, Henry served on several important committees, among which was that to prepare the address to the king. The first draft of this paper is said to have been from his pen: but as it was too advanced for the party represented by John Dickinson, the latter was added to the committee and modified the address, if he did not recast it. At a most critical period in the deliberations of that congress, Joseph Galloway, a Tory, introduced a plan of reconciliation between the mother country and the colonies, which would have left them in somewhat the same relations to each other as were subsequently established between England and Canada. The plan was advocated by some of the foremost members, and it was believed that it had the approval of the government. Mr. Henry led the opposition to it, and was the only one noted by John Adams in his diary as opposing it in debate. It was defeated by the vote of one colony only, and thus the destiny of the continent was changed. On 25 March, 1775, Mr. Henry moved in the Virginia convention that the colony be put into a state of defense at once, preparatory to the war, which was imminent, and carried his motion by a speech that for true eloquence has never been surpassed. In May following he led a volunteer force against Lord Dunmore, the royal governor of Virginia, in order to compel him to restore the colony's gunpowder, which had been removed by him from the public magazine and put on board a British ship. This was the first resistance by arms to the British authority in that colony. After obtaining from the governor remuneration for the gunpowder, he repaired to the Continental congress, then holding its second session, and at its close accepted the commission of colonel of the 1st Virginia regiment, and commander of all the Virginia forces, which had been given him by the convention of his state in his absence. His want of military experience gave occasion to some jealousy on the part of other officers, and when the Virginia troops were soon afterward taken into the Continental army, congress, in commissioning the officers, made a subordinate a brigadier-general, and offered Colonel Henry the command of a single regiment, which slight was followed by his refusal to accept the commission. He was at once elected to the Virginia convention, which met in May, 1776. Here he arranged the introduction of the resolutions directing the delegates in congress to move for independence, and determining that the colony should at once frame a bill of rights and a constitution as an independent state. By his powers of oratory he overcame all opposition, and obtained a unanimous vote for the resolutions. He was active in the formation of the constitution of his state, which served as a model for the other states, and he proposed the section of the Virginia bill of rights that guarantees religious liberty. Through his exertions, Virginia afterward asked and obtained an amendment to the Federal constitution, embodying in it a similar guarantee. On the adoption of the constitution in 1776, he was elected the first governor of the state, and was re-elected in 1777 and in 1778. Not being eligible under the constitution for four years afterward, he returned to the legislature, but was again elected governor in 1784 and 1785, and in 1786 declined a re-election. He was again elected in 1796, but again declined. During his first service as governor he had to inaugurate a new government in the midst of the Revolutionary war, and his executive talents were put to a severe test, which they stood in such a manner as greatly added to his renown. In 1777 he planned and sent out the expedition, under General George Rogers Clarke, which conquered the vast territory northwest of the Ohio, and forced England to yield it at the treaty of peace. At the close of the war he advocated the return of the banished Tories, and opening our ports at once to immigration and to commerce. He resisted the performance on our part of the treaty with Great Britain until that power had performed her treaty obligation to surrender the northwestern posts. "Among ten thousand implied powers which they may assume, they may, if engaged in war, liberate every one of your slaves if they please. And this must and will be done by men, a majority of whom have not a common interest with you. Another thing will contribute to bring this event about. Slavery is detested. We feel its fatal effects; we deplore it with all the pity of humanity. Let all these considerations, at some future period, press with full force on the minds of congress. Let that urbanity, which I trust will distinguish America, and the necessity of national defense -- let all these things operate on their minds; they will search that paper and see if they have power of manumission. And have they not, sir? Have they not power to provide for the general defense and welfare? May they not think that these call for the abolition of slavery? May they not pronounce all slaves free, and will they not be warranted by that power? This is no ambiguous implication or logical deduction. The paper speaks to the point. They have the power in clear, unequivocal terms, and will clearly and certainly exercise it." The adoption of the first eleven amendments having quieted in a great measure his apprehensions as to the constitution, he sustained the administration of Washington, though not fully approving of all its measures. The earliest manifestations of the French revolution caused him to predict the result, and the influence of French infidelity and Jacobinism upon America excited his alarm, lest they should produce disunion and anarchy. He retired from public life in 1791, after a continuous service of twenty-six years, but continued the practice of law, which he had resumed at the close of the Revolution with great success. He was appointed by Governor Henry Lee United States senator in 1794. Washington offered to make him secretary of state in 1795, and afterward chief justice of the United States, and President John Adams nominated him as a special minister to France. But the state of his health, and the care of a large family, caused him to decline these offices. In 1799, on the passage of the Virginia resolutions claiming the right of a state to resist the execution of an obnoxious act of congress, he was induced by an appeal of Washington to offer himself for a seat in the legislature, for the purpose of resisting what they both considered a doctrine fraught with the greatest danger to the Union. He did not approve of the alien and sedition laws, which occasioned the resolutions, and in his speech as a candidate he urged the use of every constitutional means to effect their repeal. He was elected, but died before taking his seat. "From my earliest childhood I had been accustomed to hear of the eloquence of Patrick Henry. On this subject there existed but one opinion in the country. The power of his eloquence was felt equally by the learned and the unlearned. No man who ever heard him speak on any important occasion could fail to admit his uncommon power over the minds of his hearers The power of Henry's eloquence was due, first, to the greatness of his emotion and passion, accompanied with a versatility which enabled him to assume at once any emotion or passion which suited his ends. Not less indispensable, secondly, was a matchless perfection of the organs of expression, including the apparatus of voice, intonation, pause, gesture, attitude, and indescribable play of countenance. In no instance did he ever indulge in an expression that was not instantly recognized as nature itself; yet some of his penetrating and subduing tones were absolutely peculiar, and as inimitable as they were indescribable. These were felt by every hearer in all their force. His mightiest feelings were sometimes indicated and communicated by a long pause, aided by an eloquent aspect, and some significant use of his fingers." "I heard the splendid display of Mr. Henry's talents as a popular orator. They were great indeed, such as I have never heard from any other man. He appeared to me to speak as Homer wrote." " He had not, indeed, the poetical fancy of Mr Henry, his sublime imagination, his lofty and overwhelming diction." Mr. Wirt, in his "Life of Henry," says that Mr. Jefferson considered him "the greatest, orator that ever lived." John Randolph, of Roanoke, pronounced him the greatest of orators, and declared that he was "Shakespeare and Garrick combined." Mr. Henry was twice married--first to Sarah Shelton, daughter of a neighbor, and afterward to Dorothea Spotswood Dandridge, a granddaughter of Governor Alexander Spotswood. He was a devoted Christian, and left a spotless character. His life has been written by William Wirt (1817), by Alexander H. Everett in Sparks's "American Biography," and by Moses Colt Tyler in the series of "American Statesmen "(Boston, 1887). No man thinks more highly than I do of the patriotism, as well as abilities, of the very worthy gentlemen who have just addressed the house. But different men often see the same subject in different lights; and, therefore, I hope it will not be thought disrespectful to those gentlemen if, entertaining as I do opinions of a character very opposite to theirs, I shall speak forth my sentiments freely and without reserve. This is no time for ceremony. The question before the house is one of awful moment to this country. For my own part, I consider it as nothing less than a question of freedom or slavery; and in proportion to the magnitude of the subject ought to be the freedom of the debate. It is only in this way that we can hope to arrive at the truth, and fulfill the great responsibility which we hold to God and our country. Should I keep back my opinions at such a time, through fear of giving offense, I should consider myself as guilty of treason towards my country, and of an act of disloyalty toward the Majesty of Heaven, which I revere above all earthly kings. Mr. President, it is natural to man to indulge in the illusions of hope. We are apt to shut our eyes against a painful truth, and listen to the song of that siren till she transforms us into beasts. Is this the part of wise men, engaged in a great and arduous struggle for liberty? Are we disposed to be of the numbers of those who, having eyes, see not, and, having ears, hear not, the things which so nearly concern their temporal salvation? For my part, whatever anguish of spirit it may cost, I am willing to know the whole truth, to know the worst, and to provide for it. I have but one lamp by which my feet are guided, and that is the lamp of experience. I know of no way of judging of the future but by the past. And judging by the past, I wish to know what there has been in the conduct of the British ministry for the last ten years to justify those hopes with which gentlemen have been pleased to solace themselves and the House. Is it that insidious smile with which our petition has been lately received? Trust it not, sir; it will prove a snare to your feet. Suffer not yourselves to be betrayed with a kiss. Ask yourselves how this gracious reception of our petition comports with those warlike preparations which cover our waters and darken our land. Are fleets and armies necessary to a work of love and reconciliation? Have we shown ourselves so unwilling to be reconciled that force must be called in to win back our love? Let us not deceive ourselves, sir. These are the implements of war and subjugation; the last arguments to which kings resort. I ask gentlemen, sir, what means this martial array, if its purpose be not to force us to submission? Can gentlement assign any other possible motive for it? Has Great Britain any enemy, in this quarter of the world, to call for all this accumulation of navies and armies? No, sir, she has none. They are meant for us: they can be meant for no other. They are sent over to bind and rivet upon us those chains which the British ministry have been so long forging. And what have we to oppose to them? Shall we try argument? Sir, we have been trying that for the last ten years. Have we anything new to offer upon the subject? Nothing. We have held the subject up in every light of which it is capable; but it has been all in vain. Shall we resort to entreaty and humble supplication? What terms shall we find which have not been already exhausted? Let us not, I beseech you, sir, deceive ourselves. Sir, we have done everything that could be done to avert the storm which is now coming on. We have petitioned; we have remonstrated; we have supplicated; we have prostrated ourselves before the throne, and have implored its interposition to arrest the tyrannical hands of the ministry and Parliament. Our petitions have been slighted; our remonstrances have produced additional violence and insult; our supplications have been disregarded; and we have been spurned, with contempt, from the foot of the throne! In vain, after these things, may we indulge the fond hope of peace and reconciliation. There is no longer any room for hope. If we wish to be free--if we mean to preserve inviolate those inestimable privileges for which we have been so long contending--if we mean not basely to abandon the noble struggle in which we have been so long engaged, and which we have pledged ourselves never to abandon until the glorious object of our contest shall be obtained--we must fight! I repeat it, sir, we must fight! An appeal to arms and to the God of hosts is all that is left us! They tell us, sir, that we are weak; unable to cope with so formidable an adversary. But when shall we be stronger? Will it be the next week, or the next year? Will it be when we are totally disarmed, and when a British guard shall be stationed in every house? Shall we gather strength but irresolution and inaction? Shall we acquire the means of effectual resistance by lying supinely on our backs and hugging the delusive phantom of hope, until our enemies shall have bound us hand and foot? Sir, we are not weak if we make a proper use of those means which the God of nature hath placed in our power. The millions of people, armed in the holy cause of liberty, and in such a country as that which we possess, are invincible by any force which our enemy can send against us. Besides, sir, we shall not fight our battles alone. There is a just God who presides over the destinies of nations, and who will raise up friends to fight our battles for us. The battle, sir, is not to the strong alone; it is to the vigilant, the active, the brave. Besides, sir, we have no election. If we were base enough to desire it, it is now too late to retire from the contest. There is no retreat but in submission and slavery! Our chains are forged! Their clanking may be heard on the plains of Boston! The war is inevitable--and let it come! I repeat it, sir, let it come. It is in vain, sir, to extentuate the matter. Gentlemen may cry, Peace, Peace--but there is no peace. The war is actually begun! The next gale that sweeps from the north will bring to our ears the clash of resounding arms! Our brethren are already in the field! Why stand we here idle? What is it that gentlemen wish? What would they have? Is life so dear, or peace so sweet, as to be purchased at the price of chains and slavery? Forbid it, Almighty God! I know not what course others may take; but as for me, give me liberty or give me death! We invite you to read a transcription of the complete text of the Declaration as presented by the National Archives. 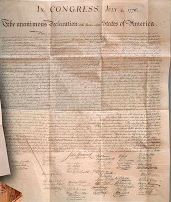 The article "The Declaration of Independence: A History," which provides a detailed account of the Declaration, from its drafting through its preservation today at the National Archives. Virtualology welcomes the addition of web pages with historical documents and/or scholarly papers on this subject. To submit a web link to this page CLICK HERE. Please be sure to include the above name, your name, address, and any information you deem appropriate with your submission. Start your search on Patrick Henry. Unauthorized Site: This site and its contents are not affiliated, connected, associated with or authorized by the individual, family, friends, or trademarked entities utilizing any part or the subject's entire name. Any official or affiliated sites that are related to this subject will be hyper linked below upon submission and Evisum, Inc. review. Copyright© 2000 by Evisum Inc.TM. All rights reserved.